Human impact on the environment or anthropogenic impact on the environment includes changes to biophysical environments and ecosystems, biodiversity, and natural resources caused directly or indirectly by humans, including global warming, environmental degradation (such as ocean acidification), mass extinction and biodiversity loss, ecological crisis, and ecological collapse. Modifying the environment to fit the needs of society is causing severe effects, which become worse as the problem of human overpopulation continues. Some human activities that cause damage (either directly or indirectly) to the environment on a global scale include human reproduction, overconsumption, overexploitation, pollution, and deforestation, to name but a few. Some of the problems, including global warming and biodiversity loss pose an existential risk to the human race, and overpopulation causes those problems. The term anthropogenic designates an effect or object resulting from human activity. The term was first used in the technical sense by Russian geologist Alexey Pavlov, and it was first used in English by British ecologist Arthur Tansley in reference to human influences on climax plant communities. The atmospheric scientist Paul Crutzen introduced the term "Anthropocene" in the mid-1970s. The term is sometimes used in the context of pollution emissions that are produced from human activity but also applies broadly to all major human impacts on the environment. Human population from 10000 BCE to 2000 CE, with its exponential rise since the eighteenth century. David Attenborough described the level of human population on the planet as a multiplier of all other environmental problems. In 2013, he described humanity as "a plague on the Earth" that needs to be controlled by limiting population growth. Some deep ecologists, such as the radical thinker and polemicist Pentti Linkola, see human overpopulation as a threat to the entire biosphere. In 2017, over 15,000 scientists around the world issued a second warning to humanity which asserted that rapid human population growth is the "primary driver behind many ecological and even societal threats." Chart published by NASA depicting CO2 levels from the past 400,000 years. Overconsumption is a situation where resource use has outpaced the sustainable capacity of the ecosystem. It can be measured by the ecological footprint, a resource accounting approach which compares human demand on ecosystems with the amount of planet matter ecosystems can renew. Estimates indicate that humanity's current demand is 70% higher than the regeneration rate of all of the planet's ecosystems combined. A prolonged pattern of overconsumption leads to environmental degradation and the eventual loss of resource bases. Humanity's overall impact on the planet is affected by many factors, not just the raw number of people. Their lifestyle (including overall affluence and resource utilization) and the pollution they generate (including carbon footprint) are equally important. In 2008, The New York Times stated that the inhabitants of the developed nations of the world consume resources like oil and metals at a rate almost 32 times greater than those of the developing world, who make up the majority of the human population. Rich western countries are now siphoning up the planet’s resources and destroying its ecosystems at an unprecedented rate. We want to build highways across the Serengeti to get more rare earth minerals for our cellphones. We grab all the fish from the sea, wreck the coral reefs and put carbon dioxide into the atmosphere. We have triggered a major extinction event [...] A world population of around a billion would have an overall pro-life effect. 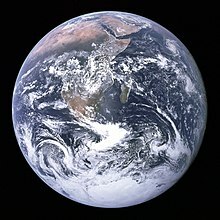 This could be supported for many millennia and sustain many more human lives in the long term compared with our current uncontrolled growth and prospect of sudden collapse [...] If everyone consumed resources at the US level – which is what the world aspires to – you will need another four or five Earths. We are wrecking our planet’s life support systems. Humanity has caused the loss of 83% of all wild mammals and half of plants  The world’s chickens are triple the weight of all the wild birds, while domesticated cattle and pigs outweigh all wild mammals by 14 to 1. The applications of technology often result in unavoidable and unexpected environmental impacts, which according to the I = PAT equation is measured as resource use or pollution generated per unit GDP. Environmental impacts caused by the application of technology are often perceived as unavoidable for several reasons. First, given that the purpose of many technologies is to exploit, control, or otherwise “improve” upon nature for the perceived benefit of humanity while at the same time the myriad of processes in nature have been optimized and are continually adjusted by evolution, any disturbance of these natural processes by technology is likely to result in negative environmental consequences. Second, the conservation of mass principle and the first law of thermodynamics (i.e., conservation of energy) dictate that whenever material resources or energy are moved around or manipulated by technology, environmental consequences are inescapable. Third, according to the second law of thermodynamics, order can be increased within a system (such as the human economy) only by increasing disorder or entropy outside the system (i.e., the environment). Thus, technologies can create “order” in the human economy (i.e., order as manifested in buildings, factories, transportation networks, communication systems, etc.) only at the expense of increasing “disorder” in the environment. According to a number of studies, increased entropy is likely to be correlated to negative environmental impacts. There are two types of indicators of environmental impact: "means-based", which is based on the farmer's production methods, and "effect-based", which is the impact that farming methods have on the farming system or on emissions to the environment. An example of a means-based indicator would be the quality of groundwater that is affected by the amount of nitrogen applied to the soil. An indicator reflecting the loss of nitrate to groundwater would be effect-based. The environmental impact of agriculture involves a variety of factors from the soil, to water, the air, animal and soil diversity, plants, and the food itself. Some of the environmental issues that are related to agriculture are climate change, deforestation, genetic engineering, irrigation problems, pollutants, soil degradation, and waste. The environmental impact of fishing can be divided into issues that involve the availability of fish to be caught, such as overfishing, sustainable fisheries, and fisheries management; and issues that involve the impact of fishing on other elements of the environment, such as by-catch and destruction of habitat such as coral reefs. These conservation issues are part of marine conservation, and are addressed in fisheries science programs. There is a growing gap between how many fish are available to be caught and humanity’s desire to catch them, a problem that gets worse as the world population grows. Similar to other environmental issues, there can be conflict between the fishermen who depend on fishing for their livelihoods and fishery scientists who realize that if future fish populations are to be sustainable then some fisheries must reduce or even close. The journal Science published a four-year study in November 2006, which predicted that, at prevailing trends, the world would run out of wild-caught seafood in 2048. The scientists stated that the decline was a result of overfishing, pollution and other environmental factors that were reducing the population of fisheries at the same time as their ecosystems were being degraded. Yet again the analysis has met criticism as being fundamentally flawed, and many fishery management officials, industry representatives and scientists challenge the findings, although the debate continues. Many countries, such as Tonga, the United States, Australia and New Zealand, and international management bodies have taken steps to appropriately manage marine resources. The impacts stem from the changed hydrological conditions owing to the installation and operation of the scheme. Effects on soil and water quality are indirect and complex, and subsequent impacts on natural, ecological and socio-economic conditions are intricate. In some, but not all instances, water logging and soil salinization can result. However, irrigation can also be used, together with soil drainage, to overcome soil salinization by leaching excess salts from the vicinity of the root zone. Irrigation can also be done extracting groundwater by (tube)wells. As a hydrological result it is found that the level of the water descends. The effects may be water mining, land/soil subsidence, and, along the coast, saltwater intrusion. Lal and Stewart estimated global loss of agricultural land by degradation and abandonment at 12 million hectares per year. In contrast, according to Scherr, GLASOD (Global Assessment of Human-Induced Soil Degradation, under the UN Environment Programme) estimated that 6 million hectares of agricultural land per year had been lost to soil degradation since the mid-1940s, and she noted that this magnitude is similar to earlier estimates by Dudal and by Rozanov et al. Such losses are attributable not only to soil erosion, but also to salinization, loss of nutrients and organic matter, acidification, compaction, water logging and subsidence. Human-induced land degradation tends to be particularly serious in dry regions. Focusing on soil properties, Oldeman estimated that about 19 million square kilometers of global land area had been degraded; Dregne and Chou, who included degradation of vegetation cover as well as soil, estimated about 36 million square kilometers degraded in the world’s dry regions. Despite estimated losses of agricultural land, the amount of arable land used in crop production globally increased by about 9% from 1961 to 2012, and is estimated to have been 1.396 billion hectares in 2012. Worldwide, the animal industry provides only 18% of calories, but uses 83% of agricultural land. Globally, enteric fermentation (mostly in ruminant livestock) accounts for about 27% of anthropogenic methane emissions, Despite methane’s 100-year global warming potential, recently estimated at 28 without and 34 with climate carbon feedbacks, methane emission is currently contributing relatively little to global warming. Although reduction of methane emissions would have a rapid effect on warming, the expected effect would be small. Other anthropogenic GHG emissions associated with livestock production include carbon dioxide from fossil fuel consumption (mostly for production, harvesting and transport of feed), and nitrous oxide emissions associated with use of nitrogenous fertilizers, growing of nitrogen-fixing legume vegetation and manure management. Management practices that can mitigate GHG emissions from production of livestock and feed have been identified. Considerable water use is associated with meat production, mostly because of water used in production of vegetation that provides feed. There are several published estimates of water use associated with livestock and meat production, but the amount of water use assignable to such production is seldom estimated. For example, “green water” use is evapotranspirational use of soil water that has been provided directly by precipitation; and “green water” has been estimated to account for 94% of global beef cattle production’s “water footprint”, and on rangeland, as much as 99.5% of the water use associated with beef production is “green water”. Some impacts of meat-producing livestock may be considered environmentally beneficial. These include waste reduction by conversion of human-inedible crop residues to food, use of livestock as an alternative to herbicides for control of invasive and noxious weeds and other vegetation management, use of animal manure as fertilizer as a substitute for those synthetic fertilizers that require considerable fossil fuel use for manufacture, grazing use for wildlife habitat enhancement, and carbon sequestration in response to grazing practices, among others. Conversely, according to some studies appearing in peer-reviewed journals, the growing demand for meat is contributing to significant biodiversity loss as it is a significant driver of deforestation and habitat destruction. Introductions of species, particularly plants into new areas, by whatever means and for whatever reasons have brought about major and permanent changes to the environment over large areas. Examples include the introduction of Caulerpa taxifolia into the Mediterranean, the introduction of oat species into the California grasslands, and the introduction of privet, kudzu, and purple loosestrife to North America. Rats, cats, and goats have radically altered biodiversity in many islands. Additionally, introductions have resulted in genetic changes to native fauna where interbreeding has taken place, as with buffalo with domestic cattle, and wolves with domestic dogs. The environmental impact of energy harvesting and consumption is diverse. In recent years there has been a trend towards the increased commercialization of various renewable energy sources. In the real world, consumption of fossil fuel resources leads to global warming and climate change. However, little change is being made in many parts of the world. If the peak oil theory proves true, more explorations of viable alternative energy sources, could be more friendly to the environment. Rapidly advancing technologies can achieve a transition of energy generation, water and waste management, and food production towards better environmental and energy usage practices using methods of systems ecology and industrial ecology. The environmental impact of coal mining and -burning is diverse. Legislation passed by the US Congress in 1990 required the United States Environmental Protection Agency (EPA) to issue a plan to alleviate toxic air pollution from coal-fired power plants. After delay and litigation, the EPA now has a court-imposed deadline of March 16, 2011, to issue its report. The environmental impact of electricity generation is significant because modern society uses large amounts of electrical power. This power is normally generated at power plants that convert some other kind of energy into electricity. Each such system has advantages and disadvantages, but many of them pose environmental concerns. The environmental impact of nuclear power results from the nuclear fuel cycle processes including mining, processing, transporting and storing fuel and radioactive fuel waste. Released radioisotopes pose a health danger to human populations, animals and plants as radioactive particles enter organisms through various transmission routes. Radiation is a carcinogen and causes numerous effects on living organisms and systems. The environmental impacts of nuclear power plant disasters such as the Chernobyl disaster, the Fukushima Daiichi nuclear disaster and the Three Mile Island accident, among others, persist indefinitely, though several other factors contributed to these events including improper management of fail safe systems and natural disasters putting uncommon stress on the generators. The radioactive decay rate of particles varies greatly, dependent upon the nuclear properties of a particular isotope. Radioactive Plutonium-244 has a half-life of 80.8 million years, which indicates the time duration required for half of a given sample to decay, though very little plutonium-244 is produced in the nuclear fuel cycle and lower half-life materials have lower activity thus giving off less dangerous radiation. The environmental impact of the oil shale industry includes the consideration of issues such as land use, waste management, and water and air pollution caused by the extraction and processing of oil shale. Surface mining of oil shale deposits causes the usual environmental impacts of open-pit mining. In addition, the combustion and thermal processing generate waste material, which must be disposed of, and harmful atmospheric emissions, including carbon dioxide, a major greenhouse gas. Experimental in-situ conversion processes and carbon capture and storage technologies may reduce some of these concerns in future, but may raise others, such as the pollution of groundwater. Dams and the reservoirs can be used to supply drinking water, generate hydroelectric power, increasing the water supply for irrigation, provide recreational opportunities and flood control. However, adverse environmental and sociological impacts have also been identified during and after many reservoir constructions. Although the impact varies greatly between different dams and reservoirs, common criticisms include preventing sea-run fish from reaching their historical mating grounds, less access to water downstream, and a smaller catch for fishing communities in the area. Advances in technology have provided solutions to many negative impacts of dams but these advances are often not viewed as worth investing in if not required by law or under the threat of fines. Whether reservoir projects are ultimately beneficial or detrimental—to both the environment and surrounding human populations— has been debated since the 1960s and probably long before that. In 1960 the construction of Llyn Celyn and the flooding of Capel Celyn provoked political uproar which continues to this day. More recently, the construction of Three Gorges Dam and other similar projects throughout Asia, Africa and Latin America have generated considerable environmental and political debate. Compared to the environmental impact of traditional energy sources, the environmental impact of wind power is relatively minor. Wind powered electricity generation consumes no fuel, and emits no air pollution, unlike fossil fuel power sources. The energy consumed to manufacture and transport the materials used to build a wind power plant is equal to the new energy produced by the plant within a few months. While a wind farm may cover a large area of land, many land uses such as agriculture are compatible, with only small areas of turbine foundations and infrastructure made unavailable for use. There are reports of bird and bat mortality at wind turbines, as there are around other artificial structures. The scale of the ecological impact may or may not be significant, depending on specific circumstances. Prevention and mitigation of wildlife fatalities, and protection of peat bogs, affect the siting and operation of wind turbines. Artificial light at night is one of the most obvious physical changes that humans have made to the biosphere, and is the easiest form of pollution to observe from space. The main environmental impacts of artificial light are due to light's use as an information source (rather than an energy source). The hunting efficiency of visual predators generally increases under artificial light, changing predator prey interactions. Artificial light also affects dispersal, orientation, migration, and hormone levels, resulting in disrupted circadian rhythms. The environmental impact of cleaning agents is diverse. In recent years, measures have been taken to reduce these effects. The environmental impact of paint is diverse. Traditional painting materials and processes can have harmful effects on the environment, including those from the use of lead and other additives. Measures can be taken to reduce environmental impact, including accurately estimating paint quantities so that wastage is minimized, use of paints, coatings, painting accessories and techniques that are environmentally preferred. The United States Environmental Protection Agency guidelines and Green Star ratings are some of the standards that can be applied. A pulp and paper mill in New Brunswick, Canada. Although pulp and paper manufacturing requires large amounts of energy, a portion of it comes from burning wood waste. The environmental impact of paper is significant, which has led to changes in industry and behaviour at both business and personal levels. With the use of modern technology such as the printing press and the highly mechanised harvesting of wood, paper has become a cheap commodity. This has led to a high level of consumption and waste. With the rise in environmental awareness due to the lobbying by environmental organizations and with increased government regulation there is now a trend towards sustainability in the pulp and paper industry. The amount of pesticide that migrates from the intended application area is influenced by the particular chemical's properties: its propensity for binding to soil, its vapor pressure, its water solubility, and its resistance to being broken down over time. Factors in the soil, such as its texture, its ability to retain water, and the amount of organic matter contained in it, also affect the amount of pesticide that will leave the area. Some pesticides contribute to global warming and the depletion of the ozone layer. The environmental impact of mining includes erosion, formation of sinkholes, loss of biodiversity, and contamination of soil, groundwater and surface water by chemicals from mining processes. In some cases, additional forest logging is done in the vicinity of mines to increase the available room for the storage of the created debris and soil. Besides creating environmental damage, the contamination resulting from leakage of chemicals also affect the health of the local population. Mining companies in some countries are required to follow environmental and rehabilitation codes, ensuring the area mined is returned to close to its original state. Some mining methods may have significant environmental and public health effects. The environmental impact of transport is significant because it is a major user of energy, and burns most of the world's petroleum. This creates air pollution, including nitrous oxides and particulates, and is a significant contributor to global warming through emission of carbon dioxide, for which transport is the fastest-growing emission sector. By subsector, road transport is the largest contributor to global warming. Environmental regulations in developed countries have reduced the individual vehicles emission; however, this has been offset by an increase in the number of vehicles, and more use of each vehicle. Some pathways to reduce the carbon emissions of road vehicles considerably have been studied. Energy use and emissions vary largely between modes, causing environmentalists to call for a transition from air and road to rail and human-powered transport, and increase transport electrification and energy efficiency. Other environmental impacts of transport systems include traffic congestion and automobile-oriented urban sprawl, which can consume natural habitat and agricultural lands. By reducing transportation emissions globally, it is predicted that there will be significant positive effects on Earth's air quality, acid rain, smog and climate change. The environmental impact of aviation occurs because aircraft engines emit noise, particulates, and gases which contribute to climate change and global dimming. Despite emission reductions from automobiles and more fuel-efficient and less polluting turbofan and turboprop engines, the rapid growth of air travel in recent years contributes to an increase in total pollution attributable to aviation. In the EU, greenhouse gas emissions from aviation increased by 87% between 1990 and 2006. Among other factors leading to this phenomenon are the increasing number of hypermobile travellers and social factors that are making air travel commonplace, such as frequent flyer programs. There is an ongoing debate about possible taxation of air travel and the inclusion of aviation in an emissions trading scheme, with a view to ensuring that the total external costs of aviation are taken into account. The environmental impact of roads includes the local effects of highways (public roads) such as on noise, light pollution, water pollution, habitat destruction/disturbance and local air quality; and the wider effects including climate change from vehicle emissions. The design, construction and management of roads, parking and other related facilities as well as the design and regulation of vehicles can change the impacts to varying degrees. An Agent Orange spray run by aircraft, part of Operation Ranch Hand, during the Vietnam War. The environmental impact of shipping includes greenhouse gas emissions and oil pollution. In 2007, carbon dioxide emissions from shipping were estimated at 4 to 5% of the global total, and estimated by the International Maritime Organization (IMO) to rise by up to 72% by 2020 if no action is taken. There is also a potential for introducing invasive species into new areas through shipping, usually by attaching themselves to the ship's hull. General military spending and military activities have marked environmental effects. The United States military is considered one of the worst polluters in the world, responsible for over 39,000 sites contaminated with hazardous materials. Several studies have also found a strong positive correlation between higher military spending and higher carbon emissions where increased military spending has a larger effect on increasing carbon emissions in the Global North than in the Global South. Military activities also affect land use and are extremely resource-intensive. As well as the cost to human life and society, there is a significant environmental impact of war. Scorched earth methods during, or after war have been in use for much of recorded history but with modern technology war can cause a far greater devastation on the environment. Unexploded ordnance can render land unusable for further use or make access across it dangerous or fatal. Child demonstrating for actions to protect the environment (2018). Human activity is causing environmental degradation, which is the deterioration of the environment through depletion of resources such as air, water and soil; the destruction of ecosystems; habitat destruction; the extinction of wildlife; and pollution. It is defined as any change or disturbance to the environment perceived to be deleterious or undesirable. As indicated by the I=PAT equation, environmental impact (I) or degradation is caused by the combination of an already very large and increasing human population (P), continually increasing economic growth or per capita affluence (A), and the application of resource-depleting and polluting technology (T). Biodiversity generally refers to the variety and variability of life on Earth, and is represented by the number of different species there are on the planet. Since its introduction, Homo sapiens (the human species) has been killing off entire species either directly (such as through hunting) or indirectly (such as by destroying habitats), causing the extinction of species at an alarming rate. Humans are the cause of the current mass extinction, called the Holocene extinction, driving extinctions to 100 to 1000 times the normal background rate. Though most experts agree that human beings have accelerated the rate of species extinction, some scholars have postulated without humans, the biodiversity of the Earth would grow at an exponential rate rather than decline. The Holocene extinction continues, with meat consumption, overfishing, ocean acidification and the amphibian crisis being a few broader examples of an almost universal, cosmopolitan decline in biodiversity. Human overpopulation (and continued population growth) along with profligate consumption are considered to be the primary drivers of this rapid decline. A 2017 statement by 15,364 scientists from 184 countries warned that, among other things, this sixth extinction event unleashed by humanity could annihilate many current life forms and consign them to extinction by the end of this century. High-level political attention on the environment has been focused largely on climate change because energy policy is central to economic growth. But biodiversity is just as important for the future of earth as climate change. It is estimated that more than 50 percent of all wildlife has been lost in the last 40 years. It is estimated that by 2020, 68% of the world's wildlife will be lost. In South America, there is believed to be a 70 percent loss. A May 2018 study published in PNAS found that 83% of wild mammals, 80% of marine mammals, 50% of plants and 15% of fish have been lost since the dawn of human civilization. Currently, livestock make up 60% of the biomass of all mammals on earth, followed by humans (36%) and wild mammals (4%). Because of human overpopulation, coral reefs are dying around the world. In particular, coral mining, pollution (organic and non-organic), overfishing, blast fishing and the digging of canals and access into islands and bays are serious threats to these ecosystems. Coral reefs also face high dangers from pollution, diseases, destructive fishing practices and warming oceans. In order to find answers for these problems, researchers study the various factors that impact reefs. The list of factors is long, including the ocean's role as a carbon dioxide sink, atmospheric changes, ultraviolet light, ocean acidification, biological virus, impacts of dust storms carrying agents to far flung reefs, pollutants, algal blooms and others. Reefs are threatened well beyond coastal areas. General estimates show approximately 10% world's coral reefs are already dead. It is estimated that about 60% of the world's reefs are at risk due to destructive, human-related activities. The threat to the health of reefs is particularly strong in Southeast Asia, where 80% of reefs are endangered. Domestic, industrial and agricultural wastewater makes its way to wastewater plants for treatment before being released into aquatic ecosystems. Wastewater at these treatment plants contains a cocktail of different chemical and biological contaminants which may influence surrounding ecosystems. For example, the nutrient rich water supports large populations of pollutant-tolerant Chironomidae, which in-turn attract insectivorous bats. These insects accumulate toxins in their exoskeletons and pass them on to insectivorous birds and bats. As a result, metals may accumulate in the tissues and organs of these animals, resulting in DNA damage, and histopathological lesions. Furthermore, this altered diet of fat-rich prey may cause changes in energy storage and hormone production, which may have significant impacts on torpor, reproduction, metabolism and survival. Biological contaminants such as bacteria, viruses and fungi in wastewater can also be transferred to the surrounding ecosystem. Insects emerging from this wastewater may spread pathogens to nearby water sources. Pathogens, shed from humans, can be passed from this wastewater to organisms foraging at these treatment plants. This may lead to bacterial and viral infections or microbiome dysbiosis. Global warming is the result of increasing atmospheric carbon dioxide concentrations which is caused primarily by the combustion of fossil energy sources such as petroleum, coal, and natural gas, and to an unknown extent by destruction of forests, increased methane, volcanic activity and cement production. Such massive alteration of the global carbon cycle has only been possible because of the availability and deployment of advanced technologies, ranging in application from fossil fuel exploration, extraction, distribution, refining, and combustion in power plants and automobile engines and advanced farming practices. Livestock contributes to climate change both through the production of greenhouse gases and through destruction of carbon sinks such as rain-forests. According to the 2006 United Nations/FAO report, 18% of all greenhouse gas emissions found in the atmosphere are due to livestock. The raising of livestock and the land needed to feed them has resulted in the destruction of millions of acres of rainforest and as global demand for meat rises, so too will the demand for land. Ninety-one percent of all rainforest land deforested since 1970 is now used for livestock. Potential negative environmental impacts caused by increasing atmospheric carbon dioxide concentrations are rising global air temperatures, altered hydrogeological cycles resulting in more frequent and severe droughts, storms, and floods, as well as sea level rise and ecosystem disruption. According to a 2018 study in Nature, 87% of the oceans and 77% of land (excluding Antarctica) have been altered by anthropogenic activity, and 23% of the planet's landmass remains as wilderness. Land degradation is a process in which the value of the biophysical environment is affected by a combination of human-induced processes acting upon the land. It is viewed as any change or disturbance to the land perceived to be deleterious or undesirable. Natural hazards are excluded as a cause; however human activities can indirectly affect phenomena such as floods and bush fires. This is considered to be an important topic of the 21st century due to the implications land degradation has upon agronomic productivity, the environment, and its effects on food security. It is estimated that up to 40% of the world's agricultural land is seriously degraded. ^ a b c d "Climate Science Special Report - Fourth National Climate Assessment (NCA4), Volume I, Executive Summary". U.S. Global Change Research Program. This assessment concludes, based on extensive evidence, that it is extremely likely that human activities, especially emissions of greenhouse gases, are the dominant cause of the observed warming since the mid-20th century. For the warming over the last century, there is no convincing alternative explanation supported by the extent of the observational evidence. In addition to warming, many other aspects of global climate are changing, primarily in response to human activities. Thousands of studies conducted by researchers around the world have documented changes in surface, atmospheric, and oceanic temperatures; melting glaciers; diminishing snow cover; shrinking sea ice; rising sea levels; ocean acidification; and increasing atmospheric water vapor. ^ Hawksworth, David L.; Bull, Alan T. (2008). Biodiversity and Conservation in Europe. Springer. p. 3390. ISBN 978-1402068645. ^ "Increased Ocean Acidity". Epa.gov. United States Environmental Protection Agency. 30 August 2016. Retrieved 23 November 2017. Carbon dioxide is added to the atmosphere whenever people burn fossil fuels. Oceans play an important role in keeping the Earth's carbon cycle in balance. As the amount of carbon dioxide in the atmosphere rises, the oceans absorb a lot of it. In the ocean, carbon dioxide reacts with seawater to form carbonic acid. This causes the acidity of seawater to increase. ^ Humans Are Causing the Sixth Mass Extinction in the Earth's History, Says Study. Vice. June 23, 2015. See also: Ceballos, Gerardo; Ehrlich, Paul R.; Barnosky, Anthony D.; García, Andrés; Pringle, Robert M.; Palmer, Todd M. (2015). "Accelerated modern human–induced species losses: Entering the sixth mass extinction". Science Advances. 1 (5): e1400253. Bibcode:2015SciA....1E0253C. doi:10.1126/sciadv.1400253. PMC 4640606. PMID 26601195. ^ Pimm, S. L.; Jenkins, C. N.; Abell, R.; Brooks, T. M.; Gittleman, J. L.; Joppa, L. N.; Raven, P. H.; Roberts, C. M.; Sexton, J. O. (30 May 2014). "The biodiversity of species and their rates of extinction, distribution, and protection" (PDF). Science. 344 (6187): 1246752. doi:10.1126/science.1246752. PMID 24876501. Retrieved 15 December 2016. The overarching driver of species extinction is human population growth and increasing per capita consumption. ^ Ceballos, Gerardo; Ehrlich, Paul R; Dirzo, Rodolfo (23 May 2017). "Biological annihilation via the ongoing sixth mass extinction signaled by vertebrate population losses and declines". Proceedings of the National Academy of Sciences of the United States of America. 114 (30): E6089–E6096. doi:10.1073/pnas.1704949114. PMC 5544311. PMID 28696295. ^ Stockton, Nick (22 April 2015). "The Biggest Threat to the Earth? We Have Too Many Kids". Wired.com. Retrieved 24 November 2017. ^ Perkins, Sid (July 11, 2017). "The best way to reduce your carbon footprint is one the government isn't telling you about". Science. Retrieved November 29, 2017. ^ "New Climate Risk Classification Created to Account for Potential "Existential" Threats". Scripps Institution of Oceanography. Scripps Institution of Oceanography. 14 September 2017. Retrieved 24 November 2017. A new study evaluating models of future climate scenarios has led to the creation of the new risk categories “catastrophic” and “unknown” to characterize the range of threats posed by rapid global warming. Researchers propose that unknown risks imply existential threats to the survival of humanity. ^ Phil Torres (11 April 2016). "Biodiversity loss: An existential risk comparable to climate change". Thebulletin.org. Taylor & Francis. Retrieved 24 November 2017. ^ "Human Population Growth and Climate Change". Center for Biological Diversity. Center for Biological Diversity. Retrieved 24 November 2017. ^ "Human Population Growth and Extinction". Center for Biological Diversity. ^ Bampton, M. (1999) "Anthropogenic Transformation" in Encyclopedia of Environmental Science, D. E. Alexander and R. W. Fairbridge (eds. ), Kluwer Academic Publishers, Dordrecht, The Netherlands, ISBN 0412740508. ^ Scott, Michon (2014). "Glossary". NASA Earth Observatory. Retrieved 2008-11-03. ^ "Graphic: The relentless rise of carbon dioxide – Climate Change: Vital Signs of the Planet". Climate Change: Vital Signs of the Planet. ^ "People and Planet speech". Royal Society of Arts. ^ David Attenborough – Humans are plague on Earth Archived 20 November 2016 at the Wayback Machine. The Telegraph. 22 January 2013. ^ a b Ripple WJ, Wolf C, Newsome TM, Galetti M, Alamgir M, Crist E, Mahmoud MI, Laurance WF (13 November 2017). "World Scientists' Warning to Humanity: A Second Notice". BioScience. 67 (12): 1026–1028. doi:10.1093/biosci/bix125. ^ "Graphic: The relentless rise of carbon dioxide – Climate Change: Vital Signs of the Planet". Climate Change: Vital Signs of the Planet. Retrieved 2018-11-05. ^ "Open Data Platform". Data.footprintnetwork.org. Retrieved 2018-11-16. ^ a b Carrington, Damian (21 May 2018). "Humans just 0.01% of all life but have destroyed 83% of wild mammals – study". TheGuardian.com. Retrieved 23 May 2018. ^ Seth Borenstein (21 May 2018). "Humans account for little next to plants, worms, bugs". APNews.com. Retrieved 22 May 2018. ^ Pennisi, Elizabeth (2018-05-21). "Plants outweigh all other life on Earth". Retrieved May 22, 2018. ^ Commoner, B. (1971). The closing cycle – Nature, man, and technology, Alfred A. Knopf. ^ Faber, M., Niemes, N. and Stephan, G. (2012). Entropy, environment, and resources, Springer Verlag, Berlin, Germany, ISBN 3642970494. ^ Kümmel, R. (1989). "Energy as a factor of production and entropy as a pollution indicator in macroeconomic modeling". Ecological Economics. 1 (2): 161–180. doi:10.1016/0921-8009(89)90003-7. ^ Ruth, M. (1993). Integrating economics, ecology, and thermodynamics, Kluwer Academic Publishers, ISBN 0792323777. ^ van der Warf, Hayo; Petit, Jean (December 2002). "Evaluation of the environmental impact of agriculture at the farm level: a comparison and analysis of 12 indicator-based methods". Agriculture, Ecosystems and Environment. 93 (1–3): 131–145. doi:10.1016/S0167-8809(01)00354-1. ^ Oppenlander, Richard (2013). Food Choice and Sustainability. Minneapolis, MN: Langdon Street Press. pp. 120–123. ISBN 978-1-62652-435-4. ^ Myers, R. A.; Worm, B. (2003). "Rapid worldwide depletion of predatory fish communities". Nature. 423 (6937): 280–283. Bibcode:2003Natur.423..280M. doi:10.1038/nature01610. PMID 12748640. ^ Worm, Boris; Barbier, E. B.; Beaumont, N.; Duffy, J. E.; Folke, C.; Halpern, B. S.; Jackson, J. B. C.; Lotze, H. K.; et al. (2006-11-03). "Impacts of Biodiversity Loss on Ocean Ecosystem Services". Science. 314 (5800): 787–790. Bibcode:2006Sci...314..787W. doi:10.1126/science.1132294. PMID 17082450. ^ Juliet Eilperin (2009-11-02). "Seafood Population Depleted by 2048, Study Finds". The Washington Post. ^ "Document card | FAO | Food and Agriculture Organization of the United Nations". Fao.org. Retrieved 2018-12-27. ^ "State of World Fisheries and Aquaculture 2018". Sustainable Fisheries UW. 2018-07-10. Retrieved 2018-12-27. ^ van Hoorn, J. W. and J.G. van Alphen. 2006. Salinity control. In: H.P. Ritzema (ed. ), Drainage Principles and Applications. Publication 16, International Institute for Land Reclamation and Improvement (ILRI), Wageningen, The Netherlands. pp. 533–600. ^ Thakkar, Himanshu (8 November 1999). "Assessment of Irrigation in India" (PDF). Dams.org. ^ Pearce, R. (2006). When the rivers run dry: Water – the defining crisis of the twenty-first century, Beacon Press, ISBN 0807085731. ^ Lal, R. and B. A. Stewart. 1990... Soil degradation. Springer-Verlag, New York. ^ Scherr, S. J. 1999. Soil degradation: a threat to developing country food security by 2020? International Food Policy Research Institute. Washington, D. C.
^ Oldeman, L. R.; R. T. A. Hakkeling; W. G. Sambroek (1990). "World map of the status of human-induced soil degradation. An explanatory note. GLASOD, Global Assessment of Soil Degradation. International Soil Reference and Information Centre, Wageningen" (PDF). Isric.org. ^ Eswaran, H., R. Lal and P. F. Reich. 2001. Land degradation: an overview. In. Bridges, E.M. et al. (eds.) Responses to Land Degradation. Proc. 2nd. Int. Conf. Land Degradation and Desertification, Khon Kaen, Thailand. Oxford Press, New Delhi, India. ^ a b Montgomery, D. R. (2007). "Soil erosion and agricultural sustainability". Proc. Natl. Acad. Sci. 104 (33): 13268–13272. Bibcode:2007PNAS..10413268M. doi:10.1073/pnas.0611508104. PMC 1948917. PMID 17686990. ^ a b NRCS. 2013. Summary report 2010 national resources inventory. United States Natural Resources Conservation Service. 163 pp. ^ Damian Carrington, "Avoiding meat and dairy is ‘single biggest way’ to reduce your impact on Earth ", The Guardian, 31 May 2018 (page visited on 19 August 2018). ^ a b Steinfeld, H. et al. 2006. Livestock's Long Shadow: Environmental Issues and Options. Livestock, Environment and Development, FAO, Rome. 391 pp. ^ Oppenlander, Richard (2013). Food Choice and Sustainability. Minneapolis, MN: Langdon Street Press. ISBN 978-1-62652-435-4. ^ Oppenlander, Richard (2013). Food Choice and Sustainability. Minneapolis, MN: Langdon Street Press. pp. 17–25. ISBN 978-1-62652-435-4. ^ a b Intergovernmental Panel on Climate Change. (2013). Climate change 2013, The physical science basis. Fifth Assessment Report. ^ Boadi, D (2004). "Mitigation strategies to reduce enteric methane emissions from dairy cows: Update review". Can. J. Anim. Sci. 84 (3): 319–335. doi:10.4141/a03-109. ^ Martin, C. et al. 2010. Methane mitigation in ruminants: from microbe to the farm scale. Animal 4 : 351–365. ^ Eckard, R. J.; et al. (2010). "Options for the abatement of methane and nitrous oxide from ruminant production: A review". Livestock Science. 130 (1–3): 47–56. doi:10.1016/j.livsci.2010.02.010. ^ Dalal, R.C. ; et al. (2003). "Nitrous oxide emission from Australian agricultural lands and mitigation options: a review". Australian Journal of Soil Research. 41 (2): 165–195. doi:10.1071/sr02064. ^ Klein, C. A. M.; Ledgard, S. F. (2005). "Nitrous oxide emissions from New Zealand agriculture – key sources and mitigation strategies". Nutrient Cycling in Agroecosystems. 72: 77–85. doi:10.1007/s10705-004-7357-z. ^ Mekonnen, M. M. and Hoekstra, A. Y. (2010). The green, blue and grey water footprint of farm animals and animal products. Vol. 2: appendices. Value of Water Research Report Series No. 48. UNESCO-IHE Institute for Water Education. ^ Damian Carrington, "Humans just 0.01% of all life but have destroyed 83% of wild mammals – study", The Guardian, 21 May 2018 (page visited on 19 August 2018). ^ US Department of Agriculture Red meat and poultry production. ^ Holechek, J. L.; et al. (1982). "Manipulation of grazing to improve or maintain wildlife habitat". Wildlife Soc. Bull. 10: 204–210. ^ Manley, J. T.; Schuman, G. E.; Reeder, J. D.; Hart, R. H. (1995). "Rangeland soil carbon and nitrogen responses to grazing". J. Soil Water Cons. 50: 294–298. ^ Franzluebbers, A.J. ; Stuedemann, J. A. (2010). "Surface soil changes during twelve years of pasture management in the southern Piedmont USA". Soil Sci. Soc. Am. J. 74 (6): 2131–2141. Bibcode:2010SSASJ..74.2131F. doi:10.2136/sssaj2010.0034. ^ Hance, Jeremy (October 20, 2015). "How humans are driving the sixth mass extinction". The Guardian. Retrieved January 24, 2017. ^ Morell, Virginia (August 11, 2015). "Meat-eaters may speed worldwide species extinction, study warns". Science. Retrieved January 24, 2017. ^ Devlin, Hannah (July 19, 2018). "Rising global meat consumption 'will devastate environment'". The Guardian. Retrieved August 13, 2018. ^ Kay, J. (2002). "On Complexity Theory, Exergy and Industrial Ecology: Some Implications for Construction Ecology", pp. 72–107 in: Kibert C., Sendzimir J., Guy, B. (eds.) Construction Ecology: Nature as the Basis for Green Buildings, London: Spon Press, ISBN 0203166140. ^ Baksh, B.; Fiksel J. (2003). "The Quest for Sustainability: Challenges for Process Systems Engineering" (PDF). AIChE Journal. 49 (6): 1350–1358. doi:10.1002/aic.690490602. Archived from the original (PDF) on 2011-07-20. Retrieved 2011-03-16. ^ USDA-USDoE. (1998). Life cycle inventory of biodiesel and petroleum diesel in an urban bus. NREL/SR-580-24089 UC Category 1503. ^ Huo, H.; Wang, M.; Bloyd, C.; Putsche, V. (2009). "Life-cycle assessment of energy use and greenhouse gas emissions of soybean-derived biodiesel and renewable fuels". Environ. Sci. Technol. 43 (3): 750–756. Bibcode:2009EnST...43..750H. doi:10.1021/es8011436. ^ Atadashi, I. M; Arou, M. K.; Aziz, A. A. (2010). "High quality biodiesel and its diesel engine application: a review". Renewable and Sustainable Energy Reviews. 14 (7): 1999–2008. doi:10.1016/j.rser.2010.03.020. ^ "coal power: air pollution". Ucsusa.org. ^ Smith, G. (2012). Nuclear roulette: The truth about the most dangerous energy source on earth, Chelsea Green Publishing, ISBN 160358434X. ^ Bartis, Jim (2006-10-26). Unconventional Liquid Fuels Overview (PDF). World Oil Conference. Boston: Association for the Study of Peak Oil and Gas. Archived from the original (PDF) on 2011-07-21. Retrieved 2007-06-28. ^ Diesendorf, Mark (Summer 2004). "Why Australia needs wind power" (PDF). Dissent. 13: 43–48. Archived from the original (PDF) on July 6, 2011. ^ Eilperin, Juliet; Mufson, Steven (April 16, 2009). "Renewable Energy's Environmental Paradox". The Washington Post. Retrieved 2009-04-17. ^ "Wind farms". Royal Society for the Protection of Birds. 2005-09-14. Retrieved 2008-09-07. ^ Lindsay, Richard (October 2004). "WIND FARMS AND BLANKET PEAT The Bog Slide of 16th October 2003 at Derrybrien, Co. Galway, Ireland" (PDF). The Derrybrien Development Cooperatve Ltd. Archived from the original (PDF) on 18 December 2013. Retrieved 20 May 2009. ^ Hölker, Franz; Wolter, Christian; Perkin, Elizabeth K.; Tockner, Klement (December 2010). "Light pollution as a biodiversity threat". Trends in Ecology & Evolution. 25 (12): 681–682. doi:10.1016/j.tree.2010.09.007. PMID 21035893. ^ Sutter, John D. (December 12, 2016). "How to stop the sixth mass extinction". Cnn.com. Retrieved July 7, 2017. ^ Miller GT (2004), Sustaining the Earth, 6th edition. Thompson Learning, Inc. Pacific Grove, California. Chapter 9, pp. 211–216, ISBN 0534400876. ^ Part 1. Conditions and provisions for developing a national strategy for biodiversity conservation. Biodiversity Conservation National Strategy and Action Plan of Republic of Uzbekistan. Prepared by the National Biodiversity Strategy Project Steering Committee with the Financial Assistance of The Global Environmental Facility (GEF) and Technical Assistance of United Nations Development Programme (UNDP, 1998). Retrieved on September 17, 2007. ^ a b Kellogg RL, Nehring R, Grube A, Goss DW, and Plotkin S (February 2000), Environmental indicators of pesticide leaching and runoff from farm fields. United States Department of Agriculture Natural Resources Conservation Service. Retrieved on 2007-10-03. ^ Reynolds, JD (1997), International pesticide trade: Is there any hope for the effective regulation of controlled substances? Archived 2012-05-27 at the Wayback Machine Florida State University Journal of Land Use & Environmental Law, Volume 131. Retrieved on 2007-10-16. ^ U.S. EPA. Pharmaceuticals and Personal Care Products. Accessed 16 March 2009. ^ Logging of forests and debris dumping. Ngm.nationalgeographic.com (2002-10-17). Retrieved on 2012-05-11. ^ Poisoning by mines. Ngm.nationalgeographic.com (2002-10-17). Retrieved on 2012-05-11. ^ a b c Fuglestvedt, J.; Berntsen, T.; Myhre, G.; Rypdal, K.; Skeie, R. B. (2008). "Climate forcing from the transport sectors". Proceedings of the National Academy of Sciences. 105 (2): 454–458. Bibcode:2008PNAS..105..454F. doi:10.1073/pnas.0702958104. PMC 2206557. PMID 18180450. ^ Worldwatch Institute (16 January 2008). "Analysis: Nano Hypocrisy?". ^ Carbon Pathways Analysis – Informing Development of a Carbon Reduction Strategy for the Transport Sector | Claverton Group. Claverton-energy.com (2009-02-17). Retrieved on 2012-05-11. ^ Environment Canada. "Transportation". Archived from the original on July 13, 2007. Retrieved 30 July 2008. ^ Pereira, G.; et al. (2010). "Residential exposure to traffic emissions and adverse pregnancy outcomes". S.a.p.i.en.s. 3 (1). ^ International Civil Aviation Organization, Air Transport Bureau (ATB). "Aircraft Engine Emissions". Archived from the original on June 1, 2002. Retrieved 2008-03-19. ^ "What is the impact of flying?". Enviro.aero. Archived from the original on June 30, 2007. Retrieved 2008-03-19. ^ Carleton, Andrew M.; Lauritsen, Ryan G (2002). "Contrails reduce daily temperature range" (PDF). Nature. 418 (6898): 601. Bibcode:2002Natur.418..601T. doi:10.1038/418601a. PMID 12167846. Archived from the original (PDF) on 2006-05-03. ^ "Climate change: Commission proposes bringing air transport into EU Emissions Trading Scheme" (Press release). EU press release. 2006-12-20. Retrieved 2008-01-02. ^ a b Gössling S, Ceron JP, Dubois G, Hall CM, Gössling S, Upham P, Earthscan L (2009). "Hypermobile travellers", pp. 131–151 (Chapter 6) in: Climate Change and Aviation: Issues, Challenges and Solutions, London, ISBN 1844076202. ^ Including Aviation into the EU ETS: Impact on EU allowance prices. ICF Consulting for DEFRA, February 2006. ^ Vidal, John (3 March 2007) CO2 output from shipping twice as much as airlines. The Guardian. Retrieved on 2012-05-11. ^ Greenhouse gas emissions Archived 2009-07-07 at the Portuguese Web Archive. Imo.org. Retrieved on 2012-05-11. ^ a b Jorgenson, Andrew K.; Clark, Brett (2016-05-01). "The temporal stability and developmental differences in the environmental impacts of militarism: the treadmill of destruction and consumption-based carbon emissions". Sustainability Science. 11 (3): 505–514. doi:10.1007/s11625-015-0309-5. ISSN 1862-4065. ^ "The US Department of Defense Is One of the World's Biggest Polluters". Newsweek.com. 2014-07-17. Retrieved 2018-05-26. ^ Bradford, John Hamilton; Stoner, Alexander M. (2017-08-11). "The Treadmill of Destruction in Comparative Perspective: A Panel Study of Military Spending and Carbon Emissions, 1960-2014". Journal of World-Systems Research. 23 (2): 298–325. doi:10.5195/jwsr.2017.688. ISSN 1076-156X. ^ Lawrence, Michael J.; Stemberger, Holly L.J. ; Zolderdo, Aaron J.; Struthers, Daniel P.; Cooke, Steven J. (2015). "The effects of modern war and military activities on biodiversity and the environment". Environmental Reviews. 23 (4): 443–460. doi:10.1139/er-2015-0039. hdl:1807/69913. ^ see Gledistch, Nils (1997). Conflict and the Environment. Kluwer Academic Publishers. ^ a b Johnson, D.L. ; Ambrose, S.H. ; Bassett, T.J.; Bowen, M.L. ; Crummey, D.E. ; Isaacson, J.S. ; Johnson, D.N. ; Lamb, P.; Saul, M.; Winter-Nelson, A.E. (1997). "Meanings of environmental terms". Journal of Environmental Quality. 26 (3): 581–589. doi:10.2134/jeq1997.00472425002600030002x. ^ Chertow, M.R., "The IPAT equation and its variants", Journal of Industrial Ecology, 4 (4):13–29, 2001. ^ Huesemann, Michael H., and Joyce A. Huesemann (2011). Technofix: Why Technology Won’t Save Us or the Environment, Chapter 6, "Sustainability or Collapse? ", New Society Publishers, ISBN 0865717044. ^ "Anthropocene: Have humans created a new geological age?". BBC News. 2011-05-10. ^ May, R.M. (1988). "How many species are there on earth?" (PDF). Science. 241 (4872): 1441–9. Bibcode:1988Sci...241.1441M. doi:10.1126/science.241.4872.1441. PMID 17790039. ^ Ceballos, Gerardo; Ehrlich, Paul R; Dirzo, Rodolfo (23 May 2017). "Biological annihilation via the ongoing sixth mass extinction signaled by vertebrate population losses and declines". PNAS. 114 (30): E6089–E6096. doi:10.1073/pnas.1704949114. PMC 5544311. PMID 28696295. Much less frequently mentioned are, however, the ultimate drivers of those immediate causes of biotic destruction, namely, human overpopulation and continued population growth, and overconsumption, especially by the rich. These drivers, all of which trace to the fiction that perpetual growth can occur on a finite planet, are themselves increasing rapidly. ^ Vidal, John (March 15, 2019). "The Rapid Decline Of The Natural World Is A Crisis Even Bigger Than Climate Change". The Huffington Post. Retrieved March 16, 2019. ^ Dirzo, Rodolfo; Hillary S. Young; Mauro Galetti; Gerardo Ceballos; Nick J. B. Isaac; Ben Collen (2014). "Defaunation in the Anthropocene" (PDF). Science. 345 (6195): 401–406. Bibcode:2014Sci...345..401D. doi:10.1126/science.1251817. PMID 25061202. ^ Naik, Gautam (30 September 2014). "Wildlife Numbers Drop by Half Since 1970, Report Says". Wsj.com. Retrieved 23 February 2019. ^ Carrington, Damian (2016-10-26). "World on track to lose two-thirds of wild animals by 2020, major report warns". The Guardian. ISSN 0261-3077. Retrieved 2017-04-12. ^ Ceballos, G.; Ehrlich, A. H.; Ehrlich, P. R. (2015). The Annihilation of Nature: Human Extinction of Birds and Mammals. Baltimore, Maryland: Johns Hopkins University Press. pp. 135 ISBN 1421417189 – via Open Edition. ^ Coral reefs around the world Guardian.co.uk, 2 September 2009. ^ "In The Turf War Against Seaweed, Coral Reefs More Resilient Than Expected". Science Daily. June 3, 2009. Retrieved February 1, 2011. ^ Kleypas, Joan A.; Feely, Richard A.; Fabry, Victoria J.; Langdon, Chris; Sabine, Christopher L.; Robbins, Lisa L. (June 2006). "Impacts of Ocean Acidification on Coral Reefs and Other Marine Calcifiers: A Guide for Future Research" (PDF). Archived from the original (PDF) on July 20, 2011. Retrieved February 1, 2011. ^ Tun, K.; Chou, L.M. ; Cabanban, A.; Tuan, V.S. ; Philreefs; Yeemin, T.; Suharsono; Sour, K.; Lane, D. (2004). C. Wilkinson (ed.). "Status of Coral Reefs of the world: 2004": 235–276. Retrieved February 1, 2011. ^ a b Naidoo, Samantha; Vosloo, Dalene; Schoeman, M. Corrie (1 April 2015). "Haematological and genotoxic responses in an urban adapter, the banana bat, foraging at wastewater treatment works". Ecotoxicology and Environmental Safety. 114: 304–311. doi:10.1016/j.ecoenv.2014.04.043. PMID 24953517. ^ Naidoo, S.; Vosloo, D.; Schoeman, M. C. (1 April 2013). "Foraging at wastewater treatment works increases the potential for metal accumulation in an urban adapter, the banana bat (Neoromicia nana)". African Zoology. 48 (1): 39–55. doi:10.1080/15627020.2013.11407567. ^ Naidoo, Samantha; Vosloo, Dalene; Schoeman, M. Corrie (2016). "Pollutant exposure at wastewater treatment works affects the detoxification organs of an urban adapter, the Banana Bat". Environmental Pollution. 208 (Pt B): 830–839. doi:10.1016/j.envpol.2015.09.056. PMID 26602790. ^ Vosloo, Dalene; Naidoo, Samantha; Rensburg, Peet Jansen van; Claassens, Sarina; Schoeman, M. Corrie; Aswegen, Sunet van; Hill, Kate (5 January 2016). "Foraging at wastewater treatment works affects brown adipose tissue fatty acid profiles in banana bats". Biology Open. 5 (2): 92–99. doi:10.1242/bio.013524. PMC 4823980. PMID 26740572. Retrieved 23 February 2019 – via bio.biologists.org. ^ Mehl, Calvin; Marsden, Genevieve; Schoeman, M. Corrie; Vosloo, Dalene (2016). "Coping with environmental stress: The effects of wastewater pollutants on energy stores and leptin levels in insectivorous bats". Mammalian Biology. 81 (5): 527–533. doi:10.1016/j.mambio.2016.07.004. ^ Oppenlander, Richard (2013). Food Choice and Sustainability. Minneapolis, MN: Langdon Street Press. p. 31. ISBN 978-1-62652-435-4. ^ Fleischer, Evan (November 2, 2019). "Report: Just 23% of Earth's wilderness remains". Big Think. Retrieved March 3, 2019. ^ Conacher, Arthur; Conacher, Jeanette (1995). Rural Land Degradation in Australia. South Melbourne, Victoria: Oxford University Press Australia. p. 2. ISBN 978-0-19-553436-8. ^ Eswaran, H.; R. Lal; P.F. Reich (2001). "Land degradation: an overview". Responses to Land Degradation. Proc. 2nd. International Conference on Land Degradation and Desertification. New Delhi, India: Oxford Press. Archived from the original on 2012-01-20. Retrieved 2012-02-05. ^ Ian Sample (2007-08-31). "Global food crisis looms as climate change and population growth strip fertile land". The Guardian. Retrieved 2008-07-23. ^ a b Schlesinger, W. H. 1997. Biogeochemistry : An analysis of global change, San Diego, CA. ^ Galloway, J. N.; Aber, J. D.; Erisman, J. N. W.; Seitzinger, S. P.; Howarth, R. W.; Cowling, E. B.; Cosby, B. J. (2003). "The Nitrogen Cascade". BioScience. 53 (4): 341. doi:10.1641/0006-3568(2003)053[0341:TNC]2.0.CO;2. ^ Houdijk, A. L. F. M.; Verbeek, P. J. M.; Dijk, H. F. G.; Roelofs, J. G. M. (1993). "Distribution and decline of endangered herbaceous heathland species in relation to the chemical composition of the soil". Plant and Soil. 148: 137–143. doi:10.1007/BF02185393. Diamond, Jared. Collapse: How Societies Choose to Fail or Succeed, Penguin Books, 2005 and 2011 (ISBN 9780241958681). Ivanova, Diana; Stadler, Konstantin; Steen-Olsen, Kjartan; Wood, Richard; Vita, Gibran; Tukker, Arnold; Hertwich, Edgar G. (18 December 2015). "Environmental Impact Assessment of Household Consumption". Journal of Industrial Ecology. 20 (3): 526–536. doi:10.1111/jiec.12371. Sutherland W. et al. (2015). What Works in Conservation, Open Book Publishers, ISBN 9781783741571. Wikimedia Commons has media related to Human impact on the environment. Environment in multiple crises - report. BBC. 12 February 2019. The sixth mass extinction, explained. The Week. February 17, 2019. Observations Concerning the Increase of Mankind, Peopling of Countries, etc. "How Much Land Does a Man Need?"